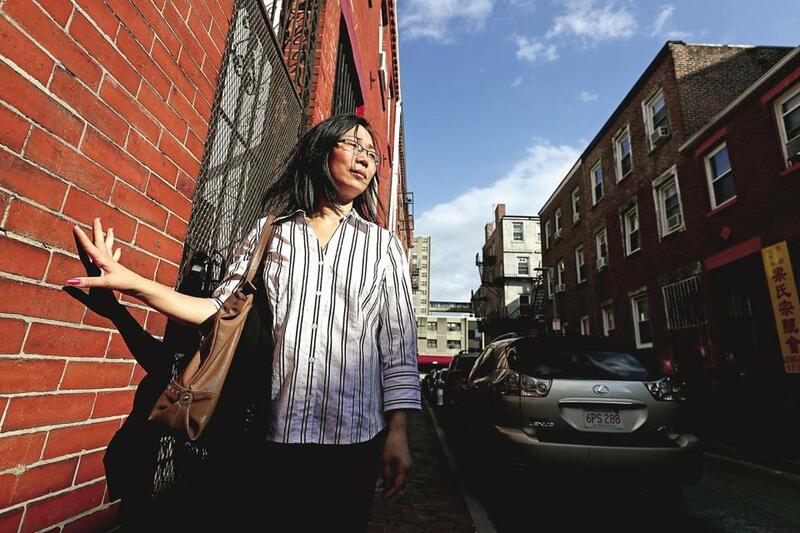 Mei Qun Huang stood near her former Johnny Court apartment, which she believes is now a short-term rental. It wasn’t long after the Chinatown row house where Mei Qun Huang lived was sold for more than $1 million that she started noticing a steady stream of travelers using the first-floor unit. The family who previously lived there had moved out after the new owner raised their rent. Earlier this year, Huang also moved out of the Johnny Court unit she had shared with her husband and three children for nearly five years — after her rent went up by 40 percent. Soon afterward, Huang heard the apartment was being used as a short-term rental. Similar scenarios are playing out with increasing frequency in Chinatown and other Boston neighborhoods, according to housing advocates. They contend that the popularity of short-term rentals, such as those listed on the website Airbnb, has encouraged investors to buy apartment buildings and shun monthly leases in favor of more profitable weekly rentals. Armed with a new study, Chinatown housing advocates are stepping up pressure on the city to regulate the rapidly growing industry, which they argue is contributing to the city’s housing crisis by removing long-term rental apartments from the market. 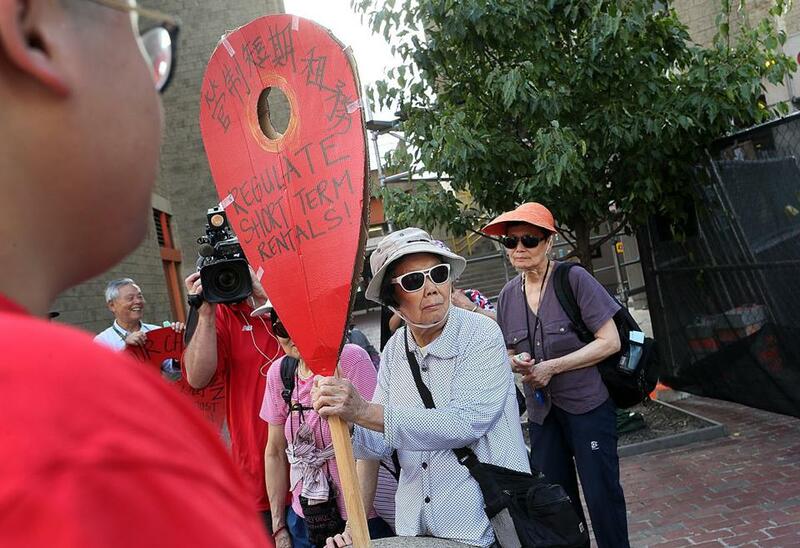 Advocacy groups, including the nonprofit Chinese Progressive Association and the Chinatown Community Land Trust, organized a march from Chinatown to the State House Thursday afternoon to bring attention to the issue. Dierong Lin held a protest sign in Chinatown on Thursday. According to the study by CLU, which is part of a national coalition with Partnership for Working Families, commercial Airbnb rentals are rapidly increasing in Boston. Sarah Jimenez, the study’s author, said she analyzed Airbnb Boston listings from December 2015 through November 2016 and found that hosts with multiple units made up 12 percent of all operators in the city but controlled more than 28 percent of the listings. Some of the listings came through corporate entities that control anywhere from a handful of units to more than 100, according to the study. A spokeswoman said Airbnb welcomes regulation of the short-term rental industry but disputes the claim that the platform is hurting Boston’s long-term rental market. Last year, 42 percent of all of Airbnb’s listings for entire homes in Boston were for homes that were rented out for a total of less than 30 days, and 68 percent were rented for less than 90 days total, according to a company report in March. About 6 percent of the listings were rented out for more than 270 nights during the year. “As income inequality continues to be an issue for cities like Boston, we hope that rules around home sharing protect neighborhoods and allow residents to continue making supplemental income to make ends meet,” the company said in a statement. Some cities, including New York and Portland, Ore., have instituted a “one host, one home” Airbnb policy, but such an arrangement has not been negotiated in Boston, according to the company. Cambridge officials in August adopted short-term rental regulations mandating that a host may rent only their own home and one other unit in the same building, provided that it has fewer than five units. Lydia Lowe, director of the Chinatown Community Land Trust, argued that investors with multiple Airbnb listings in the neighborhood are essentially operating hotels in areas that are not zoned for that. She called on city officials to shut them down. “We’re not trying to stop the [short-term rental] industry, but we should not be taking housing away from long-term residents when we’re in the middle of such a displacement crisis,” Lowe said. Housing advocates have recently detected an increase in Airbnb listings on Johnny Court and Hudson Street, as well as in a strip of row houses on Oak Street, she said. The housing advocates who organized Thursday’s march said they want state legislators to pass a bill filed by Representative Aaron Michlewitz, a Democrat whose district includes Chinatown. Under the legislation, individuals who rent their homes would be taxed at a lower rate than commercial hosts, who would be assessed at a higher rate than hotels, Michlewitz said. “We feel [commercial] hosts are directly impacting the housing market,” he said. 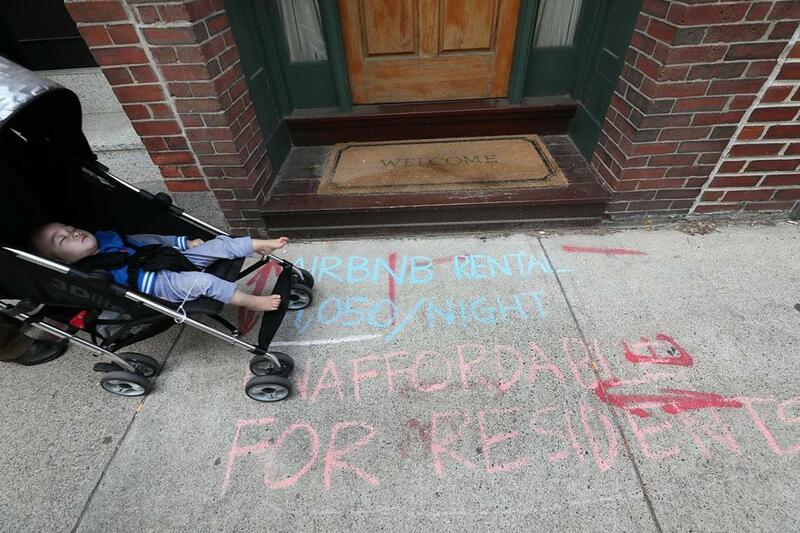 A family strolled along Oak Street, where protesters marked the sidewalk in front of a building largely being used for Airbnb rentals.